Nothing better than home. And its the same if you 'at home, away from home'. So was I this Diwali weekend at Manchester (or actually Stockport) where I really found a home. A home which was there for me since birth, with a lot of Dad's friends settled around there and having a real great time at the community. Diwali party was like oh-la-la. 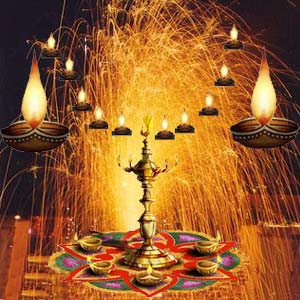 With lots of fire-crackers and Diwali sweets, and the traditional jua, and what not !!! But there was more. I got fatherly advice as well. At home-away-from-home for four days, I got them in loads. Some was verbal, some felt, known and understood. Having been here for more than two decades in UK, since the time Indians were considered second-grade citizens, they haven't lost their links with the culture and traditions they received from their home country. Plus, they are enhancing their ties to their motherland but engaging more and more in ways which lead to their interaction with India. However this is not all. "No matter where you reach, be down to earth. Remember, a man is worth interacting not by how much money he has in store or how big his deeds are. Its worthwhile to be interacting with someone who treats all at the same level and does not get dissolved in the hype which this mortal world creates around him." Big words indeed, but carry an ever bigger meaning. Life is not easy as it sounds. Its easy to be yourself and care none for else but then there is a cost to be a human-being. Sacrifice, which is not an easy option to follow; its a virtue. It requires a lot of self-restraint, discipline and the sheer will-power to get through. But that does not translate into the fact that it is impossible to achieve. But its not for giving sermons that I am here for. What I really want to share is that I got the advice from person(/s really) who had been in for more than two declares in UK and had the judgment to distinguish the better of the two systems, (UK and Indian) both culturally and otherwise. If it comes straight from the horses' mouth that retaining your values really serves, even in a potentially hostile environment, it must be so. In fact what I could perceive is that it acts as a bridge, in the path towards becoming 'global citizens', something which I had written about earlier as well. Another think that I learned was that no matter how hard the circumstance must be, one must keep doing what one wants. The results would be fabulous. Its no doubt difficult to establish oneself in a new and unwelcoming environment but then whose who persevere do achieve what they desire. I hope the words would have an ever-lasting impression on (atleast) my future course of actions!!! The definition of home is dferent for different ppl. For you, merely because the physical security of good food, information about where to get what from, the convenience of travelling, the affordability of stuff and other factors might make home secure. but think of the intellectual opportunities lost in not travelling and interacting with other people. i think it is essentially a challenge which makes you come out of your hole and which brings out the best in you. staying away from home gives u an opportunity, a sense of individualism which i personally prefer. furthermore, attachment t one's home is indeed harmful to a free soul i think... probably that's why in historical india, saints preferred to keep roaming and change their identity to "home" to prepare for a mindset where the entire universe wud be a home to them.